Most minor key songs and progressions are formed around the harmonization (e.g. chords) of two staple scales - natural minor and harmonic minor. The difference between the two scales is just one note, so the interplay between them can be subtle and therefore overlooked. This lesson, with the aid of a "guided jam track" will train your ear to hear this change and get you playing between natural and harmonic minor confidently and melodically. In many minor key progressions, natural minor will be the predominant harmonization. In other words, most minor key chords will include notes from the natural minor scale. It's when a major V (5) chord is used that we change from natural to harmonic minor, as this accomodates the major 3rd of that chord. This is a common occurence in minor keys because that major 3rd carries a strong harmonic tension (hence harmonic minor!) that has a leading effect when resolved to the tonic i (1) chord. The table to the right shows you this major V harmonic minor chord in relation to several minor keys. You can also play harmonic minor over the tonic chord, and other minor key chords (as natural and harmonic minor share some of these), but this will give you a very specific sound that might not be compatible with the effect you want. As always, experimentation is the key. Below you can download the track featured in the video in three common minor keys - Am, Em and Cm. Remember, the first chord in the sequence is our tonic chord, the root on which we build our minor scales. The final chord in the sequence is our major V chord, where we make the change to harmonic minor. These are the same diagrams shown in the guided jam video. Again, I've marked on the chord tones for each chord in the sequence, so you can build your phrases more melodically around the chord changes. Some people refer to these as "target notes", because they give your scale movements a sense of direction and purpose. For A minor, position the 1 of both patterns at the 5th fret (A). Remember to start with just playing the chord tones and gradually build your two, three, four etc. note phrases from the scale, bridging these chord tones with varied scale movements. The most effective way to learn how to improvise is to simply explore your own movements freely and listen attentively to the results. Repeat what you like the sound of and even tab it out as a lick. 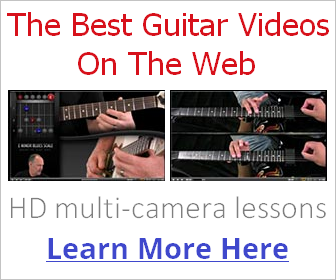 Then try to add more "feel" and embellish your phrases using bends, slides, legato and other lead techniques (see the lead section on this site for those). We'll look more in depth at developing our phrasing in a separate lesson. Here's the change to the harmonic minor pattern. I've added in the minor 7th (b7) tone as this also has a strong harmonic connection to the V chord (which is commonly played as a dominant 7th chord, e.g. E7). As mentioned, the major 3rd of the V chord (e.g. Emaj in the key of Am) is a strong harmonic tone. That doesn't mean you always have to emphasise that note in your melody, but just including it will give it some nice colour. To many musicians and listeners, touching on that major 3rd is like scratching an itch! The V chord major 3rd can be visualised as the 7th tone of harmonic minor, which means it has a leading effect towards the 1 (root) of the scale. Resolving to the root of the scale from the 7th (one semitone below the root) has a natural voice leading effect that you might want to make use of. That's how to build melodic phrases through chord changes - find a movement between two notes that work (i.e. two chord tones) and then bridge them using other tones from the scale, trying different approaches and combinations. As demonstrated in the video, certain colour tones also sound good as chord target notes. The 2nd tone of the natural minor scale, for example, works beautifully over the first three chords in our sequence and gives you a more "outside" sound. So over the A minor track that would be the note B.
I hope you enjoy using the tracks and I have no doubt you will develop more confidence with improvising in minor keys as a result.